Rose Cottage01263 715779work01603 870304fax Self-cateringRose Cottage, close to the beach, is situated in Old Hunstanton in the grounds of the owner's property. There are many attractions in Hunstanton which include a Sea Life Centre, tennis courts, indoor swimming pool and a fun fair. Three nature reserves are close by and eight miles away is the Royal Sandringham Estate. • Rose Cottage cannot accept bookings with infants / children. 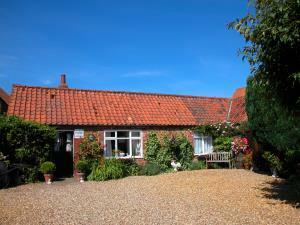 Rose Cottage, close to the beach, is situated in Old Hunstanton in the grounds of the owner's property. There are many attractions in Hunstanton which include a Sea Life Centre, tennis courts, indoor swimming pool and a fun fair. Three nature reserves are close by and eight miles away is the Royal Sandringham Estate.